Louise Atkinson (BA Hons Comedy & Bsc Social Media), Fundada (BA Hons Foreign Language), Vanessa Haley (BA Hons Film), Debi Holbrook (BA Hons Avant Garde), Duncan Lister (NVQ Pedantics), Bob Milner (BA Hons Cut ‘n’ Paste & Diploma in Artwank) and Sparrow+Castice (MPhil Mistakes). The University of Incidental Knowledge is a collaboration based on a higher education model, incorporating self-directed and peer-to-peer learning. Incidental Knowledge is acquired by chance; through the process of doing something else such as a journey, a day job, a holiday, watching a film or overhearing a conversation. It is unexpected, unintentional, extraneous, random, accidental or found, discovered in connection with or resulting from a primary activity. Next to Nothing: On the Price of Nothing and the Value of Everything is an exhibition by Black Dogs, an art collective comprising members based primarily in Leeds and London that interrogates the notion of art produced for social transformation and develops platforms for art production and presentation to exist outside and against the values of a capitalistic art system. This approach is apparent both through the issues represented in their projects, as well as their methods of self-organization that emphasize collaboration and not-for-profit motives. Next to Nothing, resulted from a series of collective meetings around notions of value and led to the exhibition in Leeds. 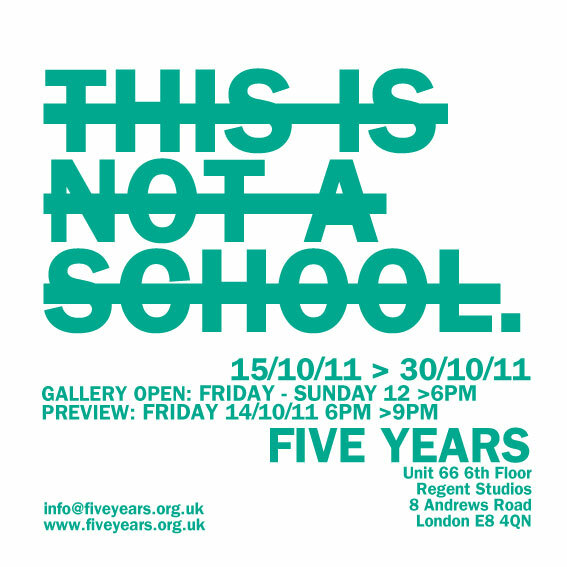 This second edition is currently presented at the +44 141 Gallery, SWG3 in Glasgow till 2 December 2011. An exploration of the issue of value through artistic practice in the United Kingdom simmers against surrounding concerns regarding budget cuts in education and culture, with pressing questions raised on the way artistic production and education has become an inextricable part of the demands of a market-driven economic system. On an individual level, artists whose works are produced to circulate outside of the art market face continual questions on allocation of their time and labor based on conflicting criteria of what constitutes value. Next to Nothing reflects these concerns, with several works pushing to the fore the manner that methods of artistic production and circulation work with, re-shape or present alternatives to economic and social structures. Luke Drozd’s Odyssey and Yvonne Carmichael’s Visual Merchandising address ideas of exchange and consumption within a retail environment, drawing on recognizable consumables and advertising to create sculptural forms that could exist comfortably in both art and retail spaces, raising the parallels in ideologies of consumption and transaction that underpin these similar modes of display. Odyssey comprises two stacks of catalogues from Argos, a large retailer of home products in the United Kingdom whose tome-sized catalogues have become ubiquitous features in many households. The grecian origins of Argos and the title of the work, Odyssey create mythic associations, provoking one to think of the way this form of economic transaction through mass production, storage, and third-party distribution has created its own distinctive set of totems that circulate in contemporary culture. Carmichael uses the rules acquired during a course on visual merchandising to create display units from a selection of supermarket housebrand products, accompanied by a checklist drawn from these visual merchandising rules with pointers from using a pyramid shape, having no more than three colors, to ensuring that products are “shoppable” from all sides. The act of making explicit these rules that exist in a retail environment, and bringing them into a gallery context, compels one to question presentation modes of artworks, and the way art experiences are created to induce a sense of desire or consumer satisfaction. The relationship between the strategies of art and display is also brought out in Charlotte A. Morgan’s works, in the context of physical structures and social processes that evolve over time. In particular, Not only the city #4, billboard support structures, a photograph that depicts blank billboards next to a railway track, considers what a space represents when its function ceases. While the works were intended to create resonances with the first exhibition site in Leeds, the display of this work at SWG3 and the considerations of time and location take on new meaning. Similar to the photograph, SWG3 sits next to a railway track and uses an old customs warehouse for artist studios and the gallery. In light of an ongoing effort to redevelop the area, one is reminded of the way cultural production restructures spaces, while becoming a tool for larger societal and economic processes that emerge through concepts of decay and regeneration. The notion of time within the context of knowledge acquisition and value is the subject of Harriet Bevan’s laborious effort to burn holes in each character of Harmsworth History of the World, a hardcover book published at the turn of the 20th century with beautiful illustrations and images to accompany descriptive historical accounts of geographical regions. The work seems to present a paradox, of seeking to undermine the value of the book as a means for knowledge acquisition. Yet, in the process, across the duration and painstaking labor of boring holes, what emerges is a compelling sense of dedication and commitment in the task at hand – values that have been submerged in a digital economy where knowledge can be easily searched for and rapidly consumed yet without a seeming end. Bevan’s work is one which strives not just towards a critique of the complicit relationship between art and the economy, but also suggests how the qualities of art as a process and practice, is by itself an alternative to considering what value is and could function, outside a capitalistic order. Another alternative is also envisioned in Alice Bradshaw’s University of Incidental Knowledge, a project devised to encourage learning through unexpected occurrences, accidents and improvisations. 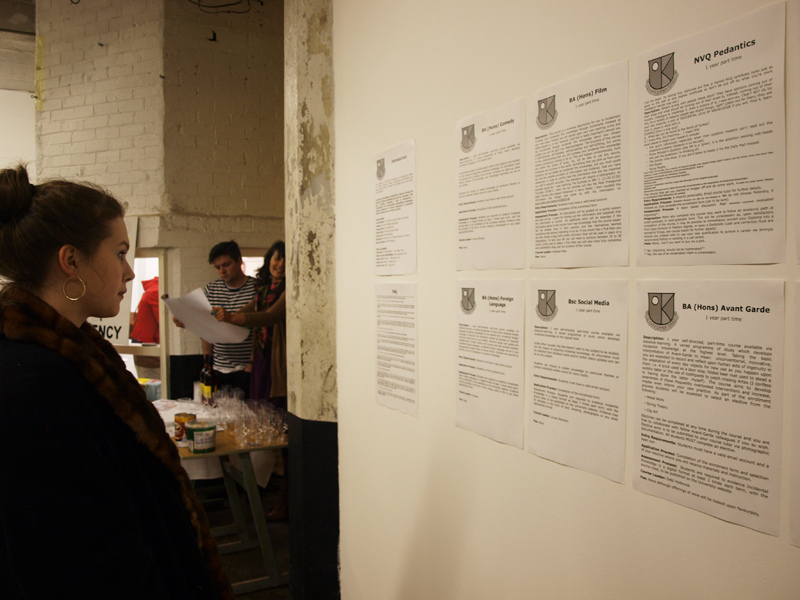 Though structured in the guise of a standard educational format with entry requirements and an application process for programs from a BA (Hons) in Cut ‘n’ Paste to an MPhil Mistakes, the project reveals the ironies present within education systems that seek to cultivate ingenuity and creativity yet create a regularized way of considering what art is and ways of producing art. Next To Nothing travelled to 0141 in Glasgow, opening 11th November and continues until 2nd December 2011. University of Incidental Knowledge students will be compiling a quiz for This Is Not A School participants from their collective incidental knowledge. 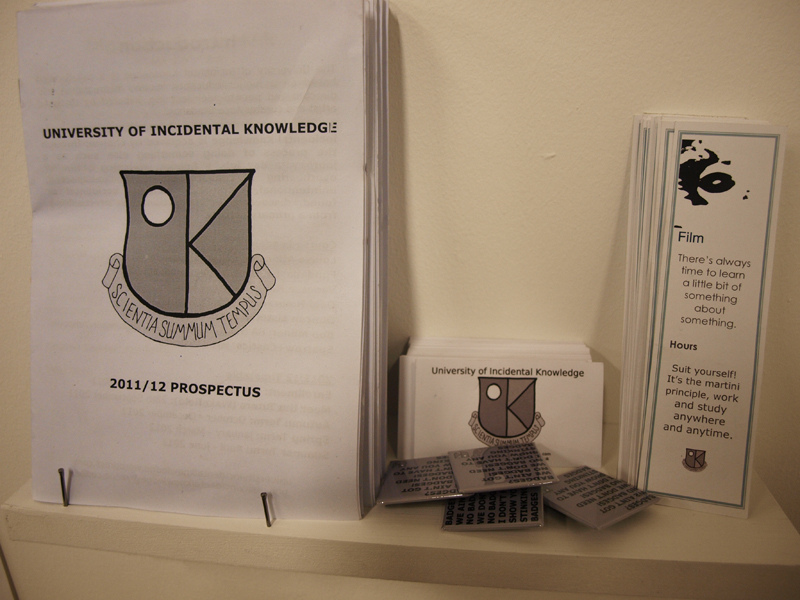 Welcome our first intake of students at the University of Incidental Knowledge! Autumn term runs October – December 2011 and we look forward to seeing coursework which can be submitted throughout term.